India: Laupatia, Laupati and Herbaggi (Assam); Layubuka, Dankena and Bekichela (West Bengal); Dendula and Dennahrah (Bihar and Uttar Pradesh); Bankoe (Orissa) and Mathiparab (Kerala) (Talwar and Jhingran, 1991). Distributions: Bangladesh, India, Myanmar, Pakistan, Sri Lanka, Malay Peninsula and Sumatra (Talwar and Jhingran, 1991). Conservation status: Endangered in Bangladesh due to habitat loss (IUCN Bangladesh, 2000). Fairly common all over Bangladesh (Rahman, 1989 and 2005). Morphology: Body elongate, deep and compressed with slightly oblique mouth. Body depth 2.5-4.1 times in standard length (Talwar and Jhingran, 1991). Lateral line complete with 34-36 (Rahman, 1989 and 2005); 31-37 (Talwar and Jhingran, 1991); 34-37 (Shafi and Quddus, 2001) scales. Pectorals wing-like and large. Body color translucent, shining silver to greenish-gray with a violet lustre on caudal peduncle (Talwar and Jhingran, 1991). Vertical steel-blue markings on sides of the body. A deep black, golden-edged blotch at the base of caudal fin. Fins are yellowish. Maximum lengths: 6.7 cm (Rahman, 1989 and 2005; IUCN Bangladesh, 2000); 5.5 cm (Talwar and Jhingran, 1991) and 8.75 cm (Shafi and Quddus, 2001). Habitats: Abundantly found in canals, beels, baors and rivers; also in paddy and jute fields during rainy season (Shafi and Quddus, 2001). Prefers mud with sandy bottom (Shafi and Quddus, 2001). Food and feeding: Surface dweller and feeds mainly on insects, also leaf and stem tissues (IUCN Bangladesh, 2000). Spawning: Breeds freely in ponds, tanks and small streams (Talwar and Jhingran, 1991). Mating takes place during dusk or dawn; about 30 eggs are scattered at a time and eggs hatch in 24 hours (IUCN Bangladesh, 2000). Fishery info: Used as ornamental fish in aquarium (Talwar and Jhingran, 1991). Also as bait for Tor, Channa and other large carnivorous fish (Talwar and Jhingran, 1991). Caught by Veshal, cast and drag nets (Shafi and Quddus, 2001). Blyth E (1860) Report on some fishes received chiefly from the Sitang River and its tributary streams, Tenasserim Provinces. Journal and Proceedings of the Asiatic Society of Bengal 29(2):138-174. Rahman AKA (1989) Freshwater Fishes of Bangladesh, 1st edition, Zoological Society of Bangladesh, Department of Zoology, University of Dhaka, Dhaka-1000, pp. 84-85. Rahman AKA (2005) Freshwater Fishes of Bangladesh, 2nd edition, Zoological Society of Bangladesh, Department of Zoology, University of Dhaka, Dhaka-1000, pp. 101-102. Shafi M and Quddus MMA (2001) Bangladesher Matsho Shampad (Fisheries of Bangladesh) (in Bengali), Kabir publication. Dhaka, Bangladesh. pp. 154-155. Talwar PK and Jhingran AG (1991) Inland Fishes of India and Adjacent Countries, Vol. 1, Oxford & IBH Publishing Co. Pvt. Ltd. New Delhi-Calcutta, pp. 316-317. Tirant G (1883) Mémoire sur les poissons de la rivière de Hué. Bulletin de la Société des Études Indo-chinoises. Saigon. 1883: 80-101. Reference: Rainboth, W.J., 1996. 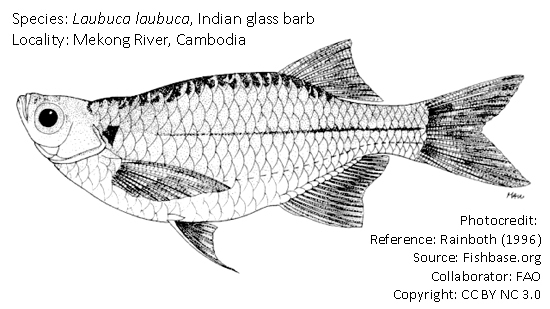 Fishes of the Cambodian Mekong. FAO Species Identification Field Guide for Fishery Purposes. FAO, Rome, 265 p.
Visited 1,015 times, 1 visits today | Have any fisheries relevant question?